I know that you often sit in class and wonder, "Why am I forced to learn about equations, Algebra and variables?" But... trust me, there are real situations where you will use your knowledge of Algebra and solving equations to solve a problem that is not school related. And... if you can't, you're going to wish that you remembered how. It might be a time when you are trying to figure out how much you should get paid for a job, or even more important, if you were paid enough for a job that you've done. It could also be a time when you are trying to figure out if you were over charged for a bill. This is important stuff - when it comes time to spend YOUR money - you are going to want to make sure that you are getting paid enough and not spending more than you have to. Ok... let's put all this newly learned knowledge to work. 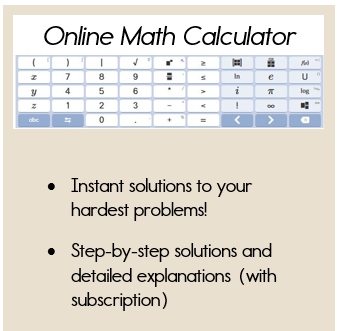 Click here if you need to review how to solve equations. First, you want to identify the unknown, which is your variable. What are you trying to solve for? Identify the variable: Use the statement, Let x = _____. You can replace the x with whatever variable you are using. Look for key words that will help you write the equation. Highlight the key words and write an equation to match the problem. Let's look at an example of an algebra word problem. Linda was selling tickets for the school play. She sold 10 more adult tickets than children tickets and she sold twice as many senior tickets as children tickets. Let x represent the number of children's tickets sold. Write an expression to represent the number of adult tickets sold. Write an expression to represent the number of senior tickets sold. Adult tickets cost $5, children's tickets cost $2, and senior tickets cost $3. Linda made $700. Write an equation to represent the total ticket sales. How many children's tickets were sold for the play? How many adult tickets were sold? How many senior tickets were sold? As you can see, this problem is massive! There are 5 questions to answer with many expressions to write. 2. For the first expression, I knew that 10 more adult tickets were sold. Since more means add, my expression was x +10. Since the direction asked for an expression, I don’t need an equal sign. An equation is written with an equal sign and an expression is without an equal sign. At this point we don’t know the total number of tickets. 3. For the second expression, I knew that my key words, twice as many meant two times as many. So my expression was 2x. 4. We know that to find the total price we have to multiply the price of each ticket by the number of tickets. Take note that since x + 10 is the quantity of adult tickets, you must put it in parentheses! So, when you multiply by the price of $5 you have to distribute the 5. 5. 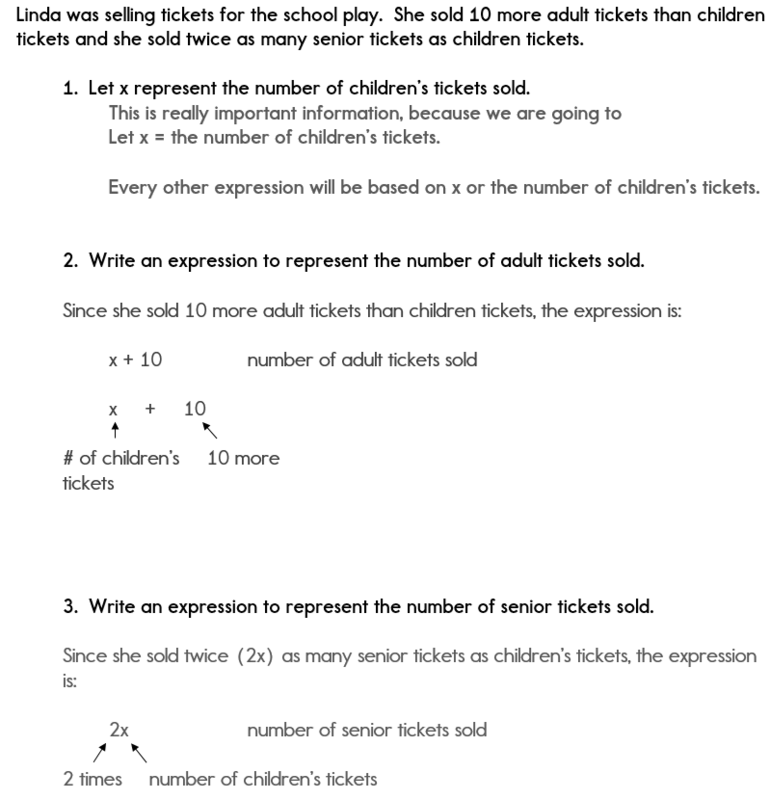 Once I solve for x, I know the number of children’s tickets and I can take my expressions that I wrote for #1 and substitute 50 for x to figure out how many adult and senior tickets were sold. 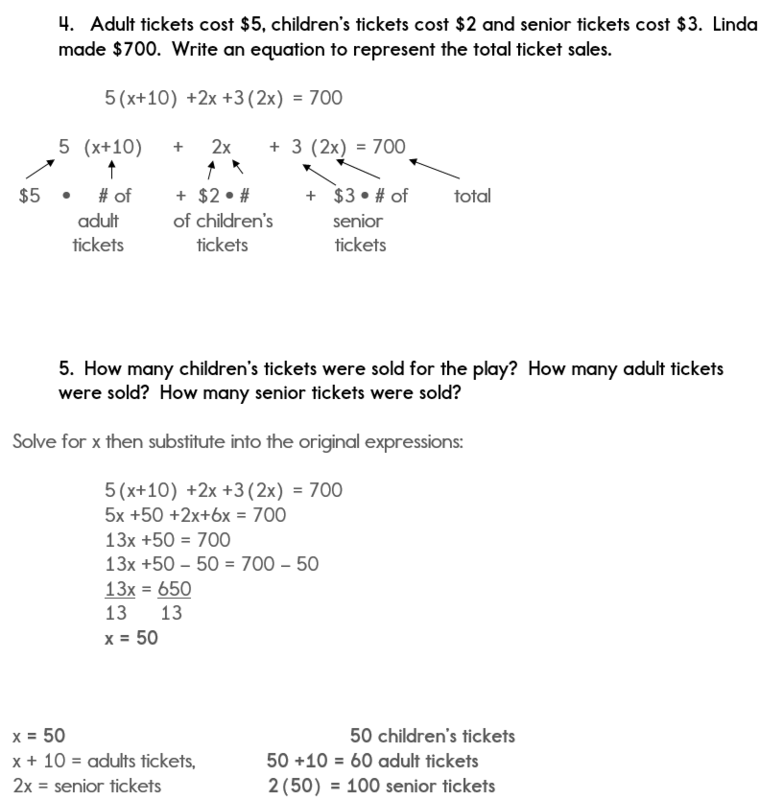 Where Can You Find More Algebra Word Problems to Practice? Word problems are the most difficult type of problem to solve in math. So, where can you find quality word problems WITH a detailed solution? 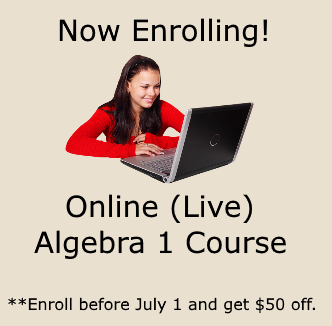 The Algebra Class E-course provides a lot of practice with solving word problems for every unit! The best part is.... if you have trouble with these types of problems, you can always find a step-by-step solution to guide you through the process! The next example shows how to identify a constant within a word problem. A cell phone company charges a monthly rate of $12.95 and $0.25 a minute per call. The bill for m minutes is $21.20. 1. Write an equation that models this situation. 2. How many minutes were charged on this bill? $12.95 is a monthly rate. Since this is a set fee for each month, I know that this is a constant. The rate does not change; therefore, it is not associated with a variable. 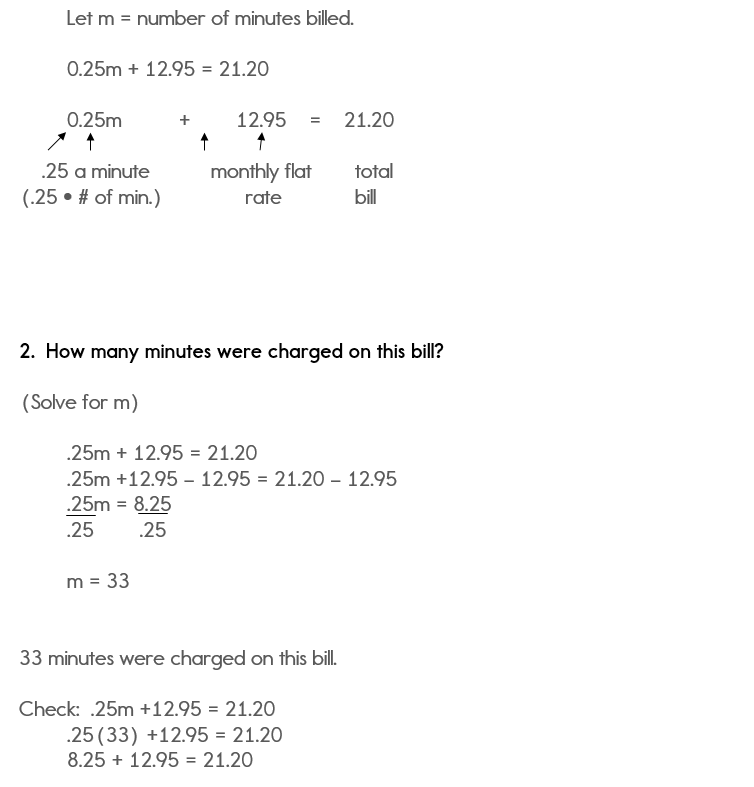 You must solve the equation to determine the value for m, which is the number of minutes charged. 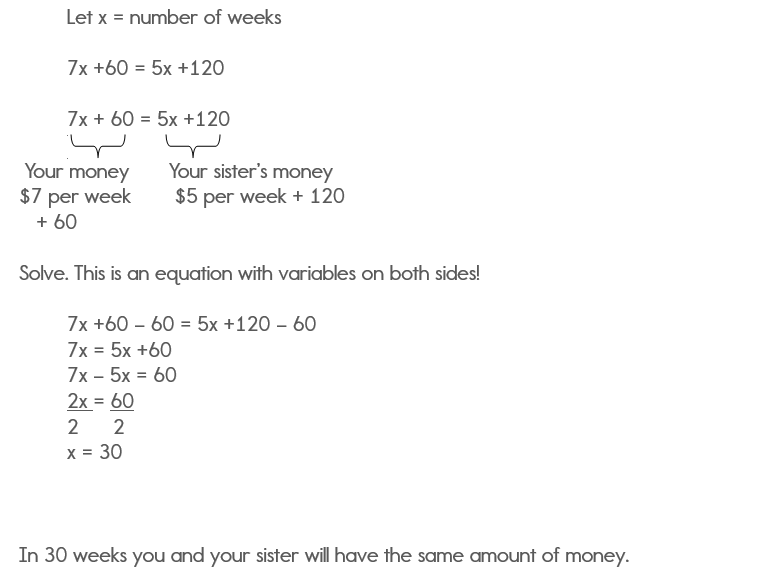 The last example is a word problem that requires an equation with variables on both sides. You have $60 and your sister has $120. You are saving $7 per week and your sister is saving $5 per week. How long will it be before you and your sister have the same amount of money? Write an equation and solve. $60 and $120 are constants because this is the amount of money that they each have to begin with. This amount does not change. $7 per week and $5 per week are rates. They key word "per" in this situation means to multiply. The key word "same" in this problem means that I am going to set my two expressions equal to each other. When we set the two expressions equal, we now have an equation with variables on both sides. After solving the equation, you find that x = 30, which means that after 30 weeks, you and your sister will have the same amount of money. I'm hoping that these three examples will help you as you solve real world problems in Algebra!